Definition: A condition where the stimulation of one sense produces the sensation of another. Like most people with synesthesia it wasn’t until my early teens that I realised that not everyone perceived the world the same way I did. I distinctly remember hearing a radio documentary about the condition and the penny dropped and I suspected that hearing pictures wan’t quite the normal way to do things. Synesthesia takes on all sorts of weird and wonderful forms from people perceiving numbers as flavours or days of the week as colours, but the condition essentially means that the sensory input one receives is responded to in a different way to the norm – somewhere in the wiring of the brain the inputs are sent to the wrong departments. In my case I mix up visual and auditory inputs to the extent that colours, textures and compositions are analysed like most people analyse music – in terms of key, harmony, timbre etc, and I respond to music in the same way most people respond to visual stimulation – chords, notes and rhythms produce distinct colours and textures. I basically ‘hear’ pictures and ‘see’ music. It’s not particularly uncommon, but I’m sure it really informs my filming and photography. I ‘listen’ to the composition of a shot, and it really matters that I keep shots within a sequence in the same ‘key’ and try to make the underlying harmony (major / minor, chord tension, dissonance etc) reflect the emotion of the sequence. Camera moves, colour palettes and composition all combine to produce a detailed orchestrated sound, I find I can change the degree of dissonance in a scene by really small changes in where I place the key compositional elements. I also find it rather unsettling to watch sequences and films that are edited in, what I perceive as, a set of mis-matched ‘keys’ – weird. I wish I was a better musician as I’m sure this condition would be really interesting to work with in the same way that it informs my filming – all I can say is that I like my guitar to sound ‘brown with a blue halo’. I’m in interesting company, David Hockney, Duke Ellington, Richard Feynman and Syd Barrett to name but a few more famous synesthetes. 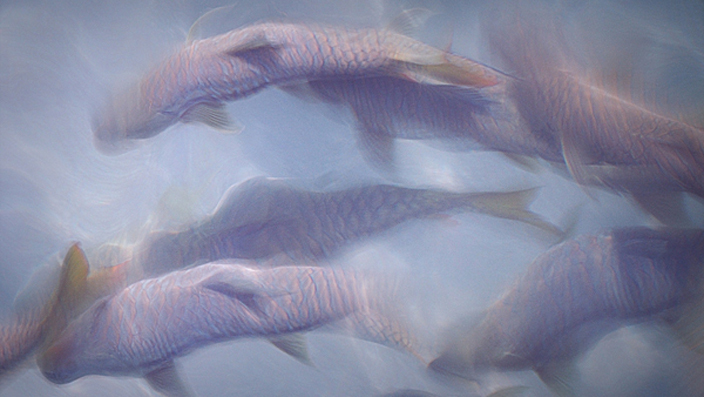 Golden Mahseer ... how does it sound to you? ?